The Pittsburgh Steelers have one of their most competitive battles ahead of preseason play at the tight end position. Although Heath Miller and Matt Spaeth continue to showcase their veteran talent, it is the group of young tight ends who are evolving into a versatile new mix in offensive coordinator Todd Haley’s offense. Rob Blanchflower had been developing into a strong blocker and showed intelligence in creating room to get into the flat, but was yet again bitten by the injury bug. He spent his rookie season (2014) on the practice squad as a result of injury and on Thursday, the Steelers placed him on the waived/injury list. The Steelers opted to claim former Iowa Hawkeye Ray Hamilton off waivers from the Dallas Cowboys. Hamilton went undrafted in 2015. At 6-feet, 4-inches (252 pounds), Hamilton will get an opportunity to be thrown into an already crowded mix. With Michael Egnew released last week, the Steelers still have Cameron Clear also pushing for a spot with the team. Although Will Johnson, who has been with Pittsburgh since 2012, can line up in the tight end position, the Steelers have consistently been working him into the H-back role – allowing him to be set back from the line of scrimmage and create lead blocks or roll out as an optional receiver. Johnson has practiced with both the tight ends and running backs during camp, but is a logical fit to remain in the dual position he has shown to excel in. Johnson was pivotal on many occasions in 2014, giving Ben Roethlisberger additional blocking, setting up in a flare route or helping pave paths for Le’Veon Bell. In this case, it isn’t broken, so there is no reason to change Johnson’s role. When Miller and Spaeth entered the league, teams were often utilizing ends as blockers. The evolution to taller, quicker ends who could give offenses more options began showcasing just how effective the position could be if the player could get off of blocks and make receptions. Many of today’s top offenses utilize tight ends in such a manner. No longer simply held on the line, Miller and Spaeth have seen their own roles expand in ways that have further improved the Steelers’ ability to move the ball against opposing defenses. 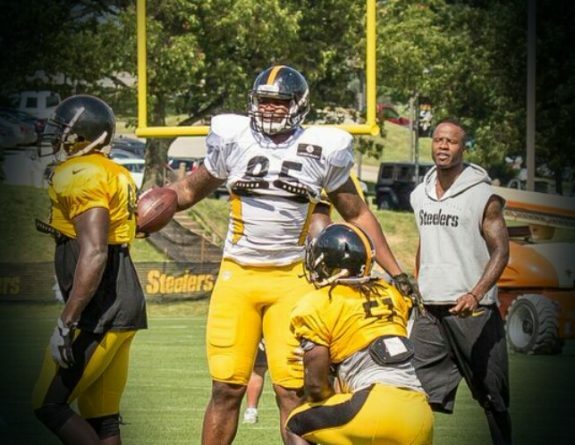 Be the first to comment on "Steelers competition at tight end still high"